At Sat-Dog we are committed to providing most efficient solutions for your business. That is why, with Sat-Dog software you can create your own database of contractors, points of sale and all places relevant for your company's work. You can save them on your web map. This feature will greatly enhance the analysis of your customer visit schedule and help you to locate your vehicles more easily. When you add a new object to your database you can specify its location, contact information and any additional data important for that particular object. You may also assign the object a specific icon and a status. Sat-Dog gives you great possibilities for you and your business. 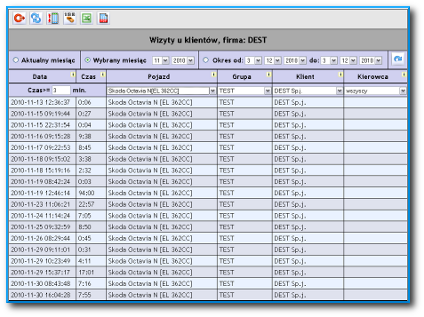 On the basis of collected tracking data and your database Sat-Dog software generates listings of customer visits in a chosen place by all your vehicles, a single one or by a particular driver (with Sat-Dog Driver Indentification Function).